Last night Mom and Dad took us to the Chinatown Night Market. I bet you there were at least 100 booths full of stuff I wanted to buy: plastic purses, fans, umbrellas, T-shirts, pencil cases and even life-sized stuffed animals. Nathan just about went crazy over all the Pokemon stuff. He couldn't decide which cards to buy. Mom kind of rolled her eyes and said we'd have to give some thought to the $15 Charizard card Nathe wanted to buy. Nathe was a little disappointed the cards weren't dirt cheap like he thought they would be. But I got a Pikachu fan and Pokeball for only $10. Mom was going to buy a ceramic Chinese girl and boy until she looked at the price. Dad wasn't interested in buying anything, but he had the money. We stayed for at least an hour, then Dad said he ran out of money. I think the noise and crowds of people were getting to him. When we got there it wasn't too busy, but by the time we left it was packed. Nathe said the smells were funny. Dad said it was just the Chinese herbs and dried up snake skins. I didn't see too much food, just some milkshakes with sweet beans on the bottom and Chinese dumplings (siu mai and ha gow). Next time I want to go later at night and see what the market looks like lit up. Anybody can go to the Chinatown Night Market, only I don't know if babies would like it because it's busy and noisy. It's kind of like taking them to a fair. Daddy's Auntie Mary didn't want to come with us either, because she said it would make her too tired. I think you can get some bargains at the Market, but you have to be careful what you're buying. Dad said they sell a lot of look-a-likes. I liked going to the Chinatown Night Market because it's different. Most of the time we shop in stores, but there you can shop outside right in the middle of the street. It's way more exciting. People even argue over prices, and sometimes they get it for less. I wouldn't say there was a lot of ethnic Chinese stuff to buy. All I saw were some Buddhas, dried up bark that Dad said was ginseng, and some Chinese clothes--oh yah, and the music tapes, boy were they loud! Like I said before, an hour is about all most parents can stand. Nathe and I could have stayed till dark, but it's not much fun if you don't have money to spend. 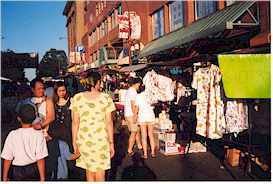 The Chinatown Night Market runs in the summer every Friday, Saturday, and Sunday night. It starts at 6:30 pm and goes until 11:00 pm. Except I don't think they have it on rainy days. The Market is on Pender Street and Keefer streets, between Main and Gore streets. You may have to drive around a bit to find a parking spot. Website: vancouverchinatown.ca/events.html, www.vancouver-chinatown.com. Also check out the Richmond Night Market. *Every Saturday until 12:00 a.m.
Venue: At 100 & 200 block of Keefer Street. (Between Gore, Main & Columbia St.), Vancouver's Chinatown. 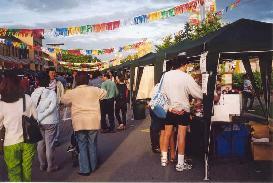 The Richmond Night Market runs from 7 p.m. to midnight on Friday and Saturday, and to 11 p.m. on Sunday, (May 20, 2005 to September 25 2005) at 12631 Vulcan Way, Richmond (behind Home Depot). Daddy said in many Asian countries people buy everything they need in outdoor markets. They don't have a lot of shopping malls like us. It's hard to imagine. How would you sell a stove or a T.V. at a booth? Mom said the Market was fun, but then she likes shopping, and it was Dad's money. I think Dad liked it for about 60 minutes, then we started losing him.